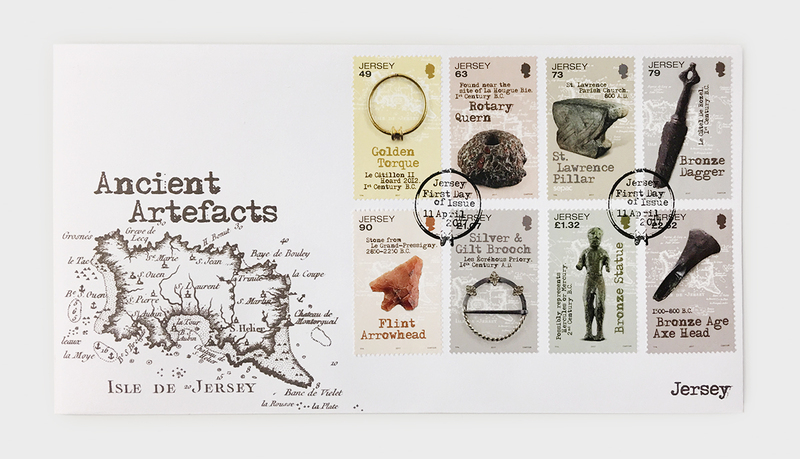 Jersey Stamps commissioned us to design a new issue celebrating a potted history of ancient artefacts that have been unearthed on the Island of Jersey. 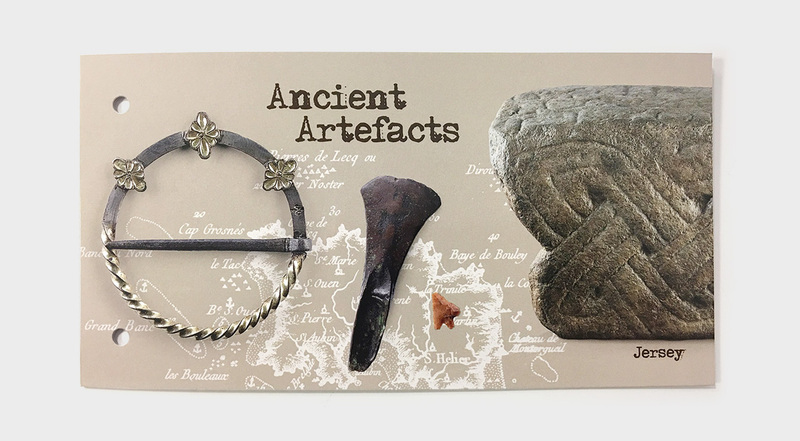 Eight artefacts left behind by neolithic settlers, nomadic hunter-gatherer tribes, and the Romans and the Gauls feature on the set. Most famously perhaps, is the gold torque, unearthed in Le Câtillon II Hoard, which contained more golden torques than any other Celtic coin hoard and has also been confirmed as the largest Celtic hoard found in the world. First issued 11 April 2017. Working with photographer Danny Evans we created eight stamps depicting: the Golden Torque from Le Câtillon II Celtic Hoard, a rotary quern found near the ancient site of La Hougue Bie in the easterly parish of Grouville, the St Lawrence Pillar, which is thought to have started life as a Roman pillar before being used as a gravestone in approximately 600 AD, a bronze dagger found on the fortified settlement of Le Câtel de Rozel, an Iron Age settlement built upon an earlier Neolithic site, a flint arrowhead found at the Le Pinacle site, dating back to 2850-2250 B.C., a 14th century silver and gilt brooch made by a Parisian jeweller found during the excavation on the floor of Les Écréhous priory hall, a bronze statue found in two halves in a field in the parish of St Clement dating back to the 2nd century B.C., and a Bronze Age axe head (provenance unknown). 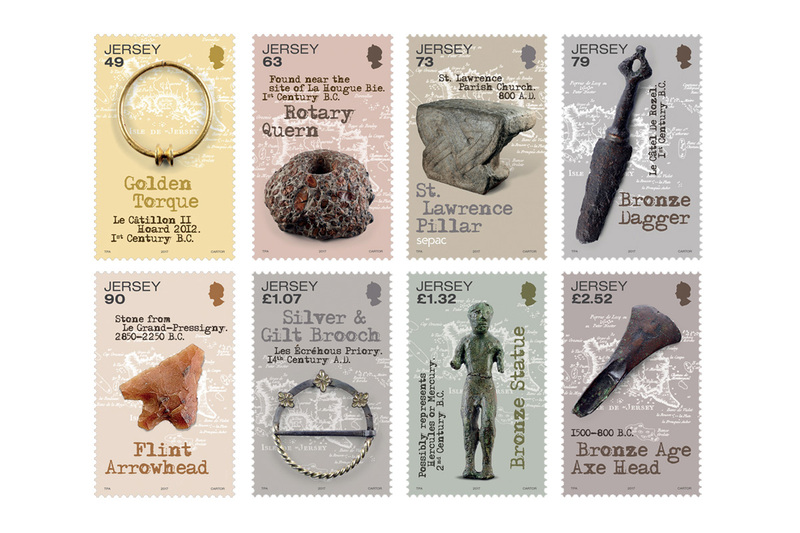 The stamps are available to purchase from Jersey Stamps.